While podcasting is a fairly low demand undertaking when it comes to technological prowess, you do still have to record, host, and publish your audio files. One way to simplify the last two is to use a hosting and publishing platform like Liberated Syndication or Libsyn (lib-sin) as they call it in the industry. Yep, believe it or not, podcasting is an industry now. What is Libsyn? The short answer is it’s an online platform that makes it easy to manage, distribute, and monetize your content. Think of it as one-stop shopping for the podcaster who has more tasks than there are hours in the day. As mentioned, you don’t NEED Libsyn but enough podcasters use it that it’s probably worth your time to check it out. Media hosting – Though most major website hosts are beginning to offer lots of space, Libsyn has designed hosting plans that take into account the massive file size of most podcasts, whether they be audio or video. A newbie podcaster can get started with the Classic 50 package for only five bucks monthly. Webpage – Part of the hassle of getting the word out about your podcast is you need an old-fashioned web presence to serve as an internet “welcome” sign. Free with all packages is a clean, simple webpage that makes it easy for visitors to learn more about your podcast and simple to subscribe and share it. You can also point a custom URL to your Libsyn hosted page. Forget the Technicalities – Most (okay maybe some) podcasters don’t want to mess with all that stuff like creating an RSS feed and providing an URL to register with podcast content aggregators like iTunes. If you hear nothing else we say, hear this. 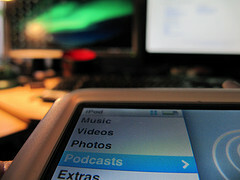 You NEED to have your podcast listed in iTunes. It’s the 800 pound gorilla in the podcasting world. Libsyn offers much, much more to beginning and veteran podcasters alike. There’s a good chance it would be worth your time to visit their website and take a look around. In case you’re wondering, no, we don’t get a kickback or affiliate commission from sending you there. We just happen to think it’s a darn good service.